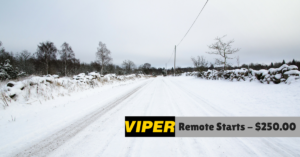 Viper Remote Car Starters sale extended forever! Over half of the 345 cars that ran through our shop during December were for remote car starts. As a thank you, we have made the promotional price our permanent price every day of the year. The $250.00 price includes installation and a lifetime warranty on the installation for as long as you own the car. Call us at 316-943-8444 with questions or to schedule an appointment!